"Fused glass, with its inherent adaptability and endless variety of forms, color, texture, and translucence, enables and challenges me to recreate the natural places I've loved, and invent the places I'd like go, if only in my mind. For me, every landscape touches a dream or memory, and often as not, a heart string." Visit Pezzulich Glassworks on Facebook for the latest news! And thank you for visiting Pezzulich Glassworks. We're probably best known for our beautiful landscape images made of glass. You'll find these works in two sections: Landscapes and Miniature Landscapes. We also create custom House Portraits -- fused glass images of your home, cabin, or beach house -- and the occasional church or monument. The works in these three galleries include currently available work as well as recently sold items. 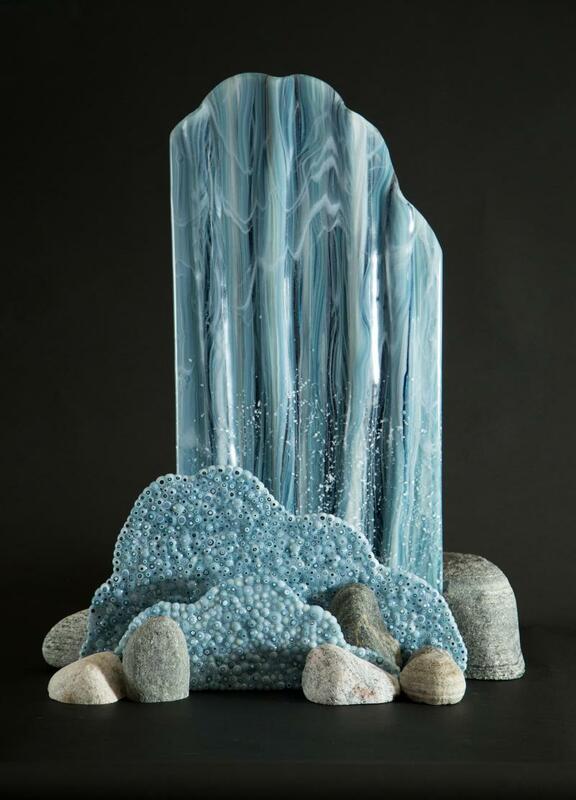 Inspired and intrigued by the endless appeal of the outdoors in all seasons, Pezzulich Glassworks creates each original fused glass landscape by hand using predominantly crushed glass, and tiny threads and strips of glass. There is no painting involved! Fused glass landscapes make wonderful wedding and other gifts -- reminding your loved ones of favorite place both real and imagined. We've added many new scenes, including the new "Waterfall" (pictured above), a sculptural piece incorporating 3 panels of glass mounted in carved stone "boulders". Of course, if you see something you like here on the website, please give us a call, and we'll arrange a time to show it to you.